Recently I was interviewed for a Kaiser Health News/NPR story on overcoming ageism in medicine and promoting geriatrics by exposing students to older adults during medical school. The story was syndicated, I got a quote, and my former employer got a media hit – and all was right with the world. Efforts to introduce relatively healthy older adults to medical students can “reduce the sense of futility and show [the students] that there are real people with real lives who can benefit from quality health care,” said Chris Langston, program director at the John A. Hartford Foundation, which focuses on aging and health. Langston has been analyzing the trend for the past several years. The reporter Susan Jaffe is excellent and was really excited about the session she had seen at Case Western Reserve School of Medical where a panel of older adults over 90 had talked to the medical students about their lives, their health, and their needs. 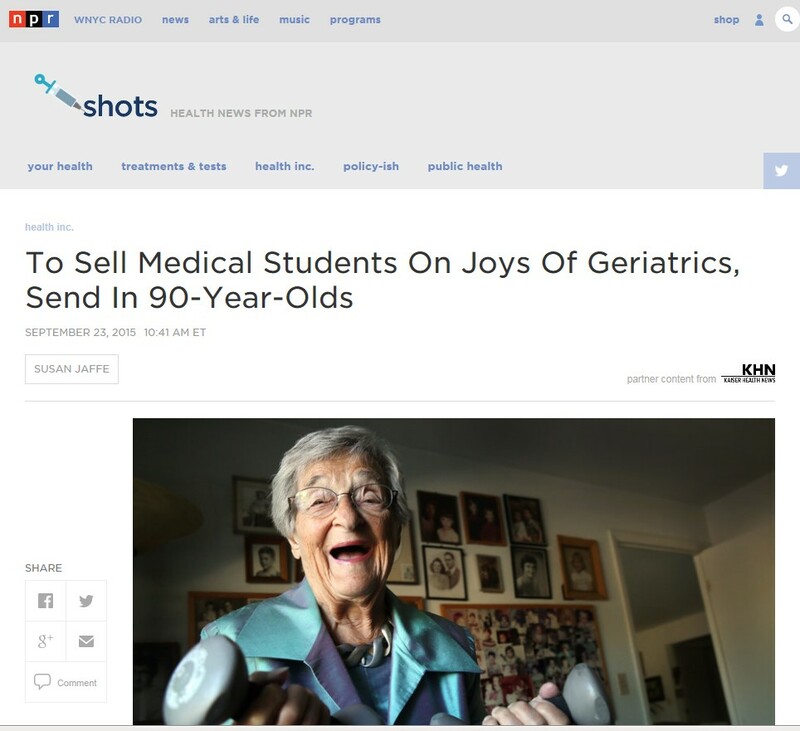 The title of the article and its tone strongly suggests that this is a new kind of program and that it will work “to sell medical students on the joys of geriatrics. As I was talking with Ms. Jaffe and telling her about this kind of program and what had been done before, I felt a wave of déjà vu and previously disconnected thoughts crystalized and my heart fell as I realized that we can be quite sure it won’t. The reporter wanted to tell the story she wanted to tell, and left most of our conversation and most of the information I provided her out of the story. But the disappointing truth is that programs like this one aren’t new, have been tried extensively, and don’t seem to have had much impact. The Donald W. Reynolds Foundation program in geriatrics education started shortly after our AAMC program and was broader but undergraduate medical education was still its sweet spot. It provided $3M! each to 40 schools over the years 2001 and 2008 ($2M of foundation cash, but $3M for geriatrics when you count the very strict $1M local match requirements). And, of course, for the academically minded future physician, the John A. Hartford Foundation was growing its summer medical student geriatrics program through the American Federation for Aging Research, supporting a couple hundred students each year in a clinical and research experience. Understanding the impact of education on competence, career choice, and patient outcomes is really hard. The delays are substantial and measures of competence are weak. The Case Western experience isn’t expected to make all attendees into geriatricians, nor were the interventions sponsored by The John A. Hartford Foundation or the Donald W. Reynolds Foundation. But it is hard to believe that if the experiences were effective in showing students the value of geriatric care and its personal and professional rewards, that we wouldn’t see some blip in enrollment in specialized fellowships when students finally finish medical school and residency and make further choices. 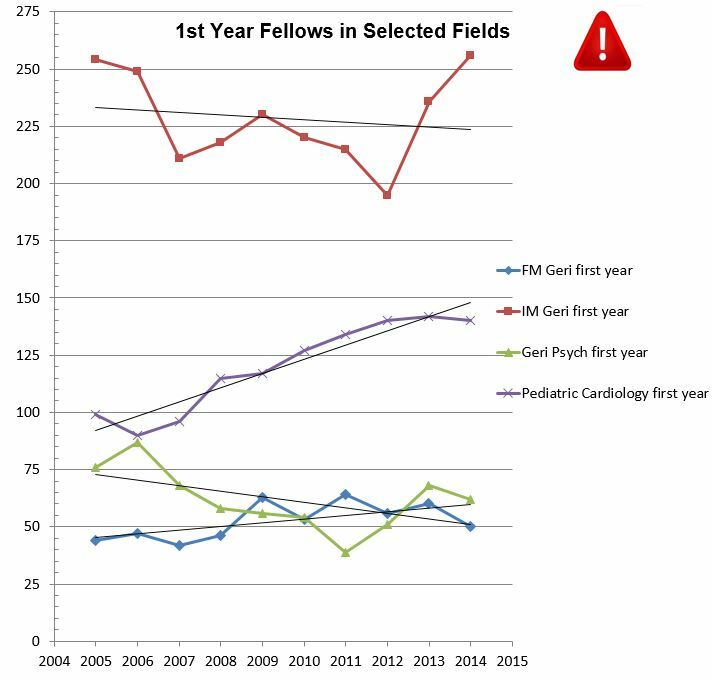 But when you look at the annual chart of graduating resident physicians choosing to specialize in geriatrics you don’t see any uptick in the 6th or 7th year following the start of these efforts. Looking at the chart, any effects would start in 2005 when 4th year students who had gotten some exposure would be deciding on fellowship. The effects should have strengthened over the next few years as students who were earlier in training got more and more exposure and could shift their residency choices as a precursor to their career choice. However, as the graph below shows, the lines in these periods are definitely flat or falling. It might be nice to think that new programs like the one reported in the media could turn the tide, but we’ve been there, done that, and all we have is the t-shirt, not the workforce we wanted. Writing about Philanthropy – What is this ‘Sustainability’ thing? Reflecting on life as a doctor, social scientist, and a person.